After spending an entire weekend at home, we were extremely sick of house projects and decided the following weekend should be spent outdoors! And why not in Yosemite? 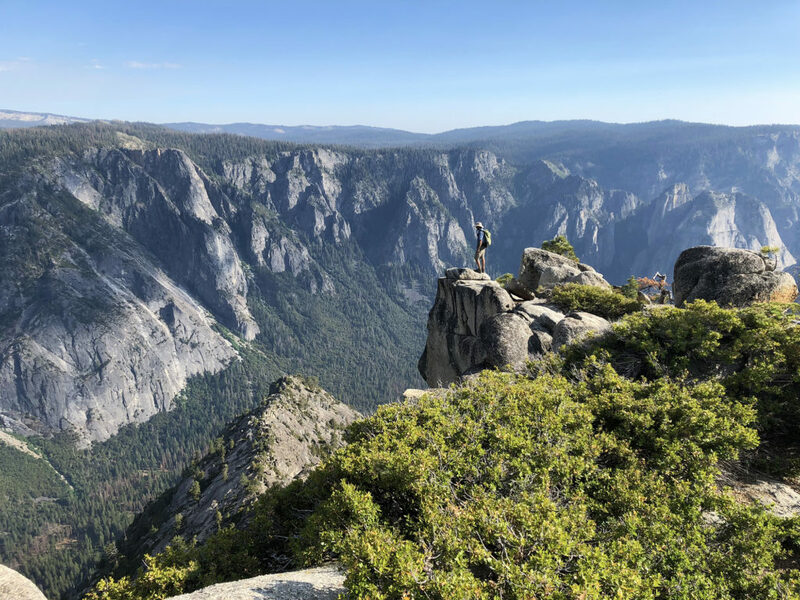 It can be surprisingly easy to get a permit for the Yosemite backcountry in the summertime… if you’re not trying to hike the JMT. And if you’re not picky. That said, it did take me about 50 attempts before I was actually able to get through to the permit office on the phone. Red Tape: Permits and bear canisters are absolutely required. Quotas apply in the summer. The park entrance fee is currently $35/vehicle. 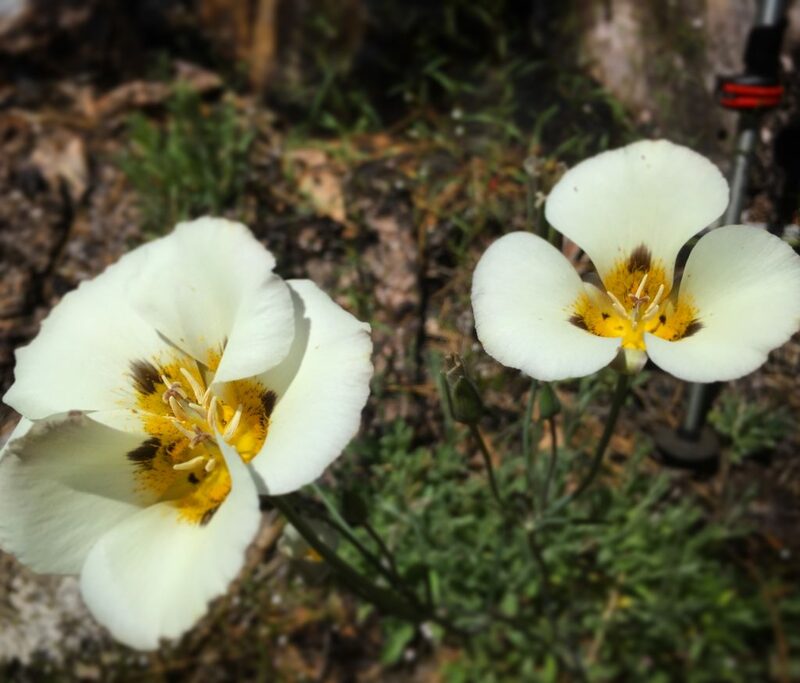 Additional Information: Visit the Yosemite NP Wilderness Permits website for more info. To check permit availability, view the Full Trailhead Report. From the Big Oak Flat entrance to Yosemite National Park, follow Highway 120 for 7.6 miles to Crane Flat. Turn left at the junction to stay on Highway 120 (toward Tuolumne Meadows and Tioga Pass). Follow Highway 120 for 16.5 more miles. There is a large turnout for the Lukens Lake trailhead. There are bear boxes at the trailhead, but no bathrooms. Google Map link to trailhead. 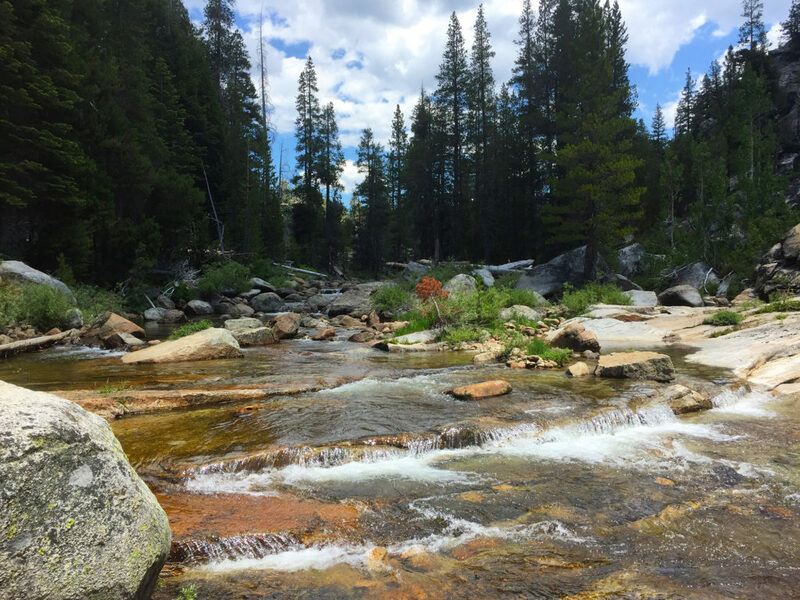 A few days before our trip, I checked online and found a trailhead with some available spots: Lukens Lake/Yosemite Creek. I pulled out my map and it looked like we could follow Yosemite Creek (which eventually spills over the rim and becomes Yosemite Falls) to Eagle Peak. I was familiar with Eagle Peak from a previous day hike, and it seemed like a pretty great place to spend the night. With a route in mind, I booked permits, invited a couple friends and packed my bag. We drove up early Sunday morning, arriving at the Big Oak Flat entrance right around 8:00 am. As we waited in the long line of cars at the kiosk, I noticed a familiar SUV a couple cars behind us. Sure enough, it was our friends Andy and Laurie. 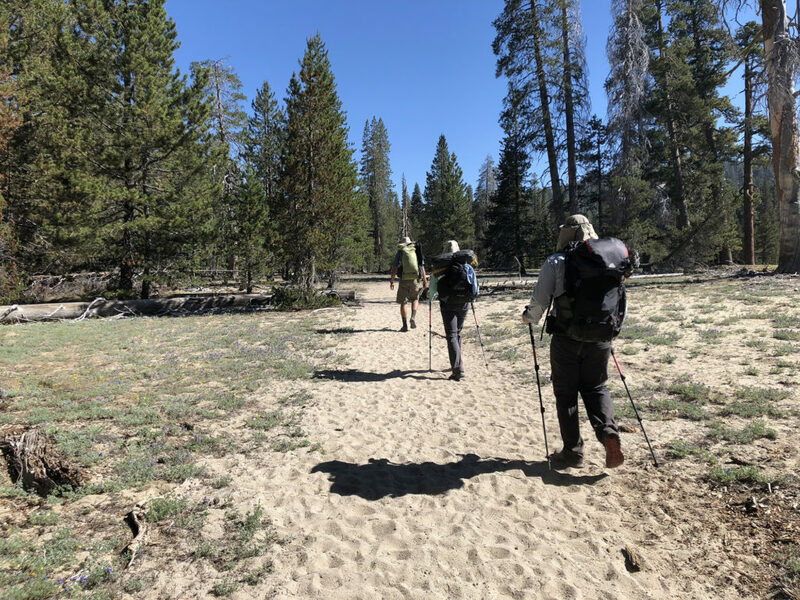 It seems that whenever we plan to meet them at a trailhead, we end up running into them unexpectedly at the Big Oak Flat entrance. We picked up our permits and drove the remaining 30-ish minutes to the Lukens Lake turnout. Lukens Lake is north of Tioga Pass Road. We never saw the lake itself because we hiked south, eventually following Yosemite Creek toward Yosemite Valley. About 3 miles in to our hike, we reached a trail junction. Laurie mentioned that we probably had gone about 1 to 2 miles. Rob’s watch said 3.04 and the map said 3.2 miles. It felt too easy! After another mile or two, we stopped and took a lunch break alongside the creek. I sat in the water and ate my sandwich. Rob said he couldn’t “swim and eat” and stayed up on the rocks away from the water until he was done eating. After our lunch stop, we only made it another 20-30 minutes further before Rob pulled over and said: I’m swimming. This is unusual because he is somewhat hydrophobic, but it was a very hot day and the trail felt excessively dusty. We all jumped in. The creek felt quite warm and I could have stayed there all day. Eventually, we gathered our things and kept hiking. As we approached Eagle Peak, we all filled up on water at the last water source: we would be dry camping that night. We reached the Eagle Peak junction and began the climb to the summit. 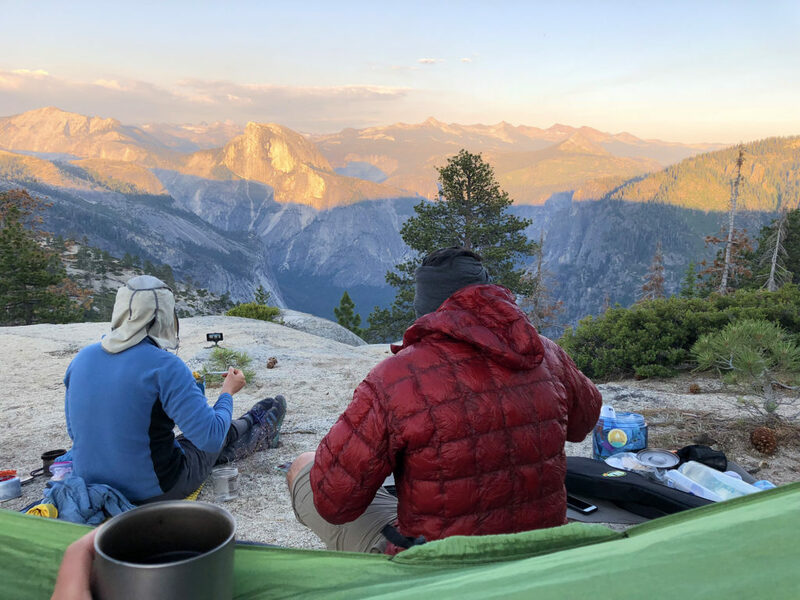 We turned off the trail somewhere on the saddle and found a flat campsite with a view of Half Dome. 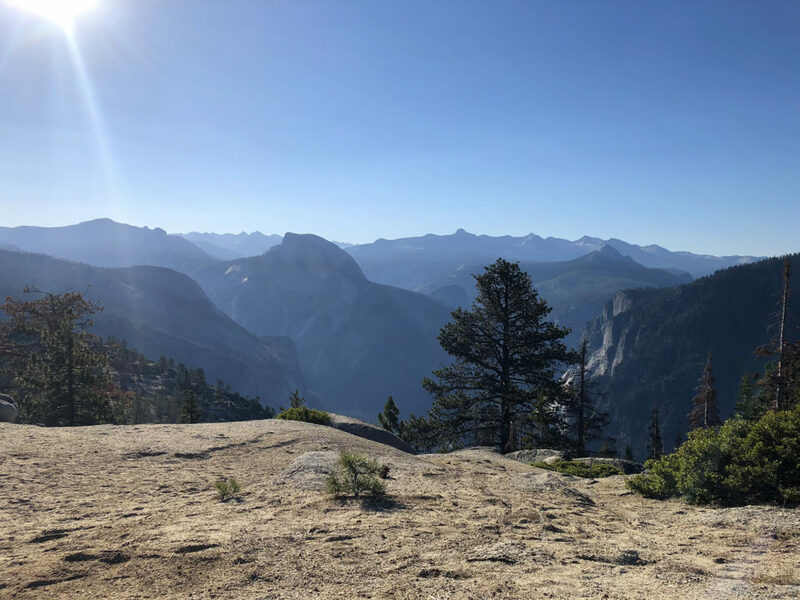 We settled in, took naps, ate more food and eventually hiked up to the the summit of Eagle Peak for a full view of Yosemite Valley. Standing on the Eagle Peak summit. It never got cold, even after the sun went down. 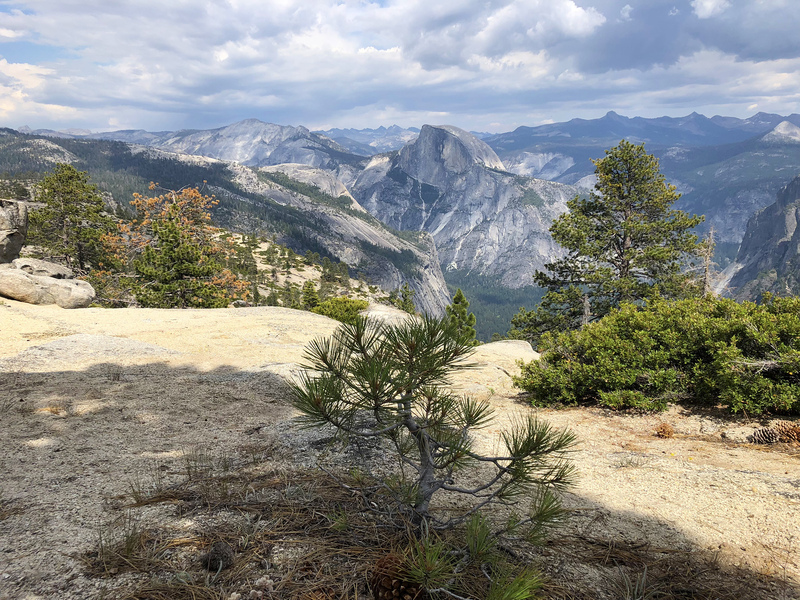 We could see campfires down in the Valley and headlamps over on the north face of Half Dome. The following day we tried to sleep in, but the sun came up before 6:00 am. 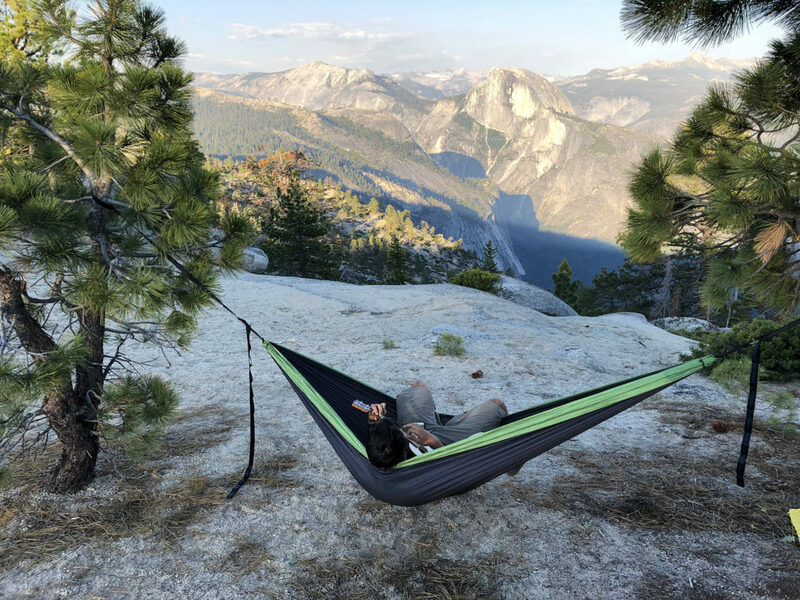 I was out of the tent, drinking cold coffee in the hammock by 6:30. We packed up and got back on the trail, hoping to hike back before the day got too warm. 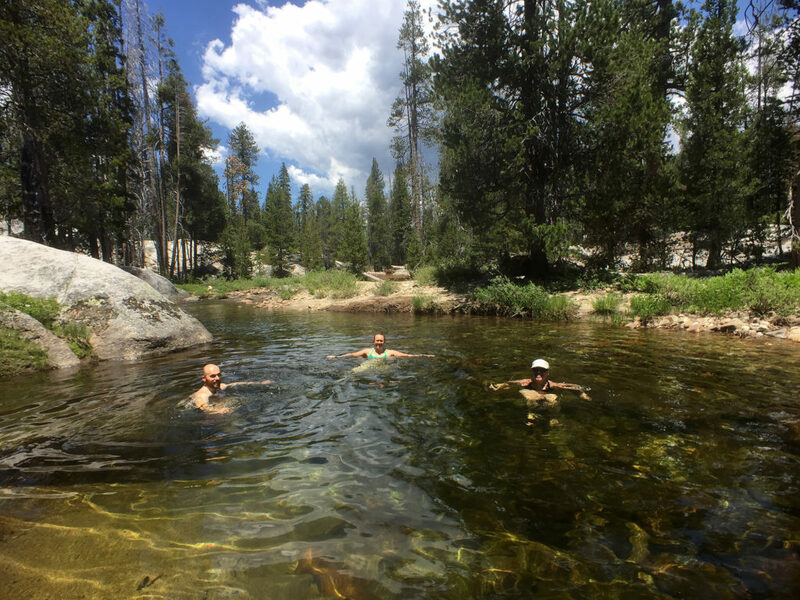 We did stop at one swimming hole, but the water felt much colder than it had the day before, so we didn’t stay too long. As we hiked back to the car, we were going uphill and the trail seemed to go on forever. The scenery was nice, but I was feeling pretty much done by the time we reached the car. We said our goodbyes and headed back into the real world. Until next time Yosemite. Ah, I see you are still posting occasionally! 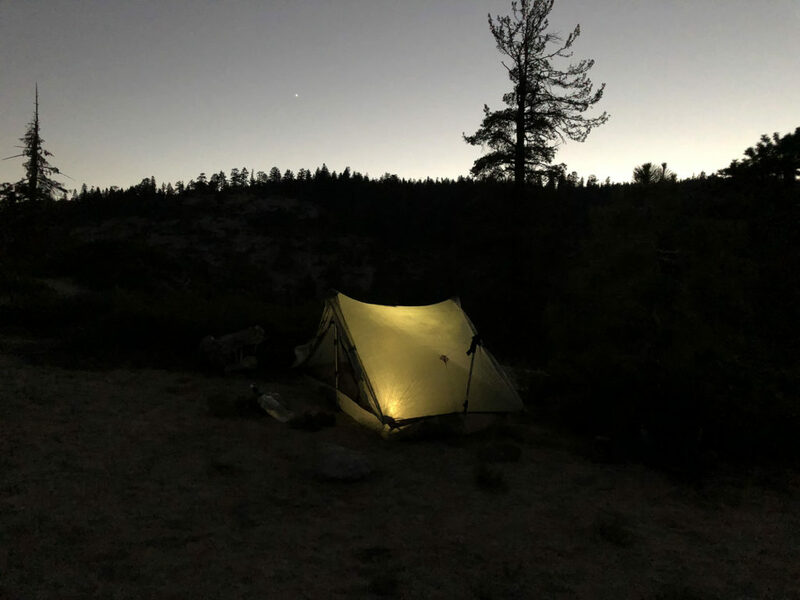 I was told about your PCT blog right after you started (by a mutual friend at Caltrans), right about the time I was deciding to start hiking regularly… I really enjoyed following your PCT adventure, and you guys inspired me to start section hiking it in CA with a group of 60-somethings. 6 sections later, I’m prepping to walk from Julian to Anza in late March, first desert hike. 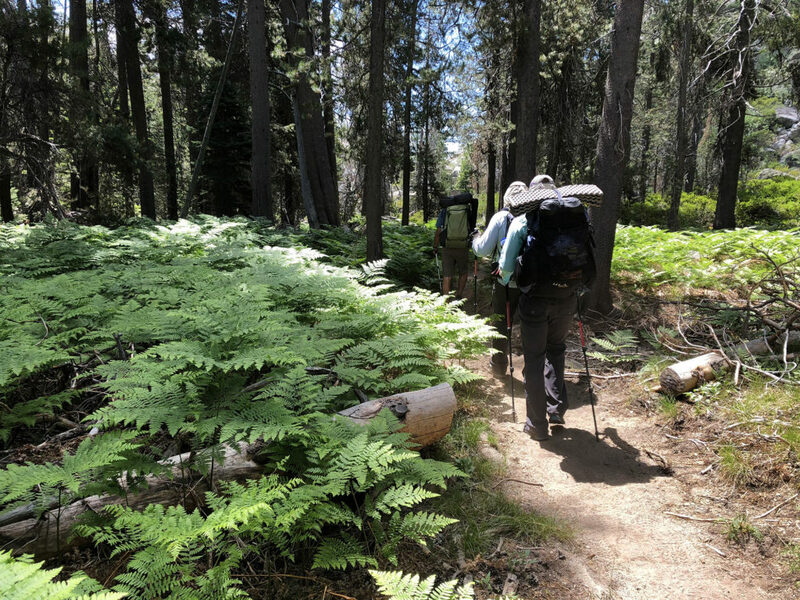 If you and Rob haven’t hiked the Mineral King/Sequoia area yet, I highly recommend it, we did a loop there in September and it was so stunning…rivals anything in Yosemite, and very few people were out there. Looking forward to more from you in the future! That is awesome that you are section hiking! I hope the desert cactus and flowers are blooming when you hit the trail in March. We were pleasantly surprised by how much we enjoyed the desert. Thanks for the Mineral King recommendation! I’ve been wanting to visit that part of Sequoia for a while. Maybe 2019 will be the year. Hoping to do quite a bit more hiking this year!